Chinese Spring Rolls – Lovefoodies hanging out! Tease your taste buds! Take a look at these crispy little delights! Come for a ride to the Far East and let’s make some Spring rolls!. We’ve got step by step instructions on how to prepare, dice, chop, roll, you name it, we’ll show you how. Chinese Spring Rolls – Lovefoodies hanging out! Tease your taste buds!. Categories: Chinese celebrations, Chinese New Year, recipes | Tags: Chinese, cook, Cooking, food, Hong Kong, how to make, lovefoodies, lumpias., Recipe, Spring Rolls | Permalink. Creme Caramel Custard – Lovefoodies hanging out! Tease your taste buds! Who would have thought that 4 simple ingredients could be transformed in to a delicious dessert, which, contrary to what you may think, is very easy to make! Creme Caramel, or milk leche, or custard flan, is an international favourite. The variation of names is testament to how far reaching across the globe this favourite dessert really is. From the Philippines to Spain, from Puerto Rico, to India, each country has it’s own version of the popular creme caramel, with varying ingredients, substituting fresh milk for condensed milk, or coconut milk. Here we will use the ingredients you see above. You may have eaten creme caramel before. What did you notice about it? Have you ever come across a creme caramel with a load of bubbles in it, or had a grainy texture? Here you will be able to get a very smooth, silky, velvety dessert, which will want you eating more! It truly is delicious! Follow the easy steps below and you are sure to wow anyone that eats your creation. It’s simply sublime! Click the link below to take you to the recipe. Creme Caramel Custard – Lovefoodies hanging out! Tease your taste buds!. Categories: recipes | Tags: baking, creme caramel, ingredients, Milk, Philippines, Puerto Rico, recipes, Spain, sweet | Permalink. British Beer Battered Fish & Chips – Lovefoodies hanging out! Tease your taste buds! Ever been to a ‘chippy’ ? Are you wondering what this strange looking meal is served on newspaper? Well, wonder no longer! Take a look at what Beer Battered Fish and Chips is all about. Pop over to Lovefoodies and see for yourself and recreate this age old traditional favourite. Guaranteed you will love it, although I have to admit, it’s not the healthiest of meals, but it is truly delicious! So click on the link below and go visit our virtual Fish and Chips shop. 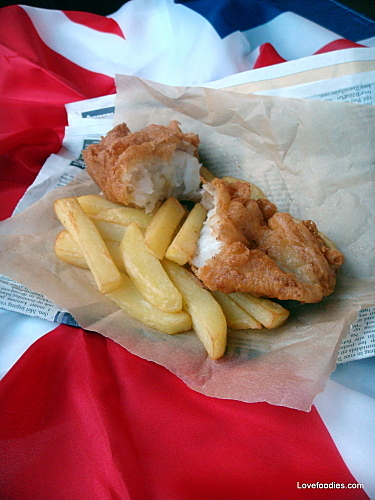 British Beer Battered Fish & Chips – Lovefoodies hanging out! Tease your taste buds!. Categories: recipes, Uncategorized | Tags: batter.beer, british, chip shop, chippy, chips, english, fish, fried, lovefoodies, Recipe, salt, traditional, vinegar | Permalink.